I love the whole ideal of “nourish”. 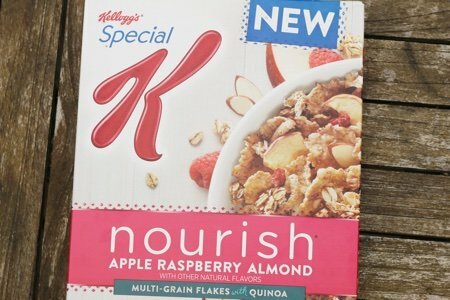 I decided to buy a box of Special K Nourish this after I saw a commercial. My motivation was that many food companies are starting to add healthier whole food ingredients (such as almonds) to make food more nutritious. Could Special K Nourish be the cereal of my dreams? First, there is the price – which was $4.59 for a 14 ounce box. Ouch! But, if has better ingredients – it might be worth it. Whole grain wheat, rice, whole grain oats, sugar, apples, almonds, corn syrup, oat bran, quinoa flour, contains 2% or less of whole wheat flour, freeze dried raspberries, soluble wheat fiber, rice flour, salt, wheat bran, brown sugar syrup, whole oat flour, degerminated yellow corn flour, malt flavor, modified corn starch, natural flavors, cornstarch, honey, defatted soy grits, molasses, tricalcium phosphate, acacia gum, soy protein isolate, apple puree concentrate*, strawberries, blueberries, oat fiber, dried cane syrup, calcium carbonate, guar gum, sodium sulfite to protect color, citric acid, BHT for freshness. Vitamins and Minerals: Vitamin C (ascorbic acid), niacinamide, reduced iron, vitamin B6 (pyridoxine hydrochloride), vitamin B1 (thiamin hydrochloride), vitamin B2 (riboflavin), vitamin A palmitate, folic acid, vitamin D3, vitamin B12. Seven different forms of sugar listed here! That has to be some kind of record for a box of cereal. Sadly sugar is listed before apples and almonds so that means there is more sugar added than apples and almonds. Don't even mention the raspberries that are in the actual name of the cereal - they are after the line that says "contains 2% or less"- oh my! I was hoping for something more NOURISHING. This has about twice my recommendation (4-5grams) of sugar per serving and it tasted like it. It reminded me of Captain Crunch (no joke) but I didn’t enjoy it as much because I kept thinking about the sad people were going to eat this because of the quinoa. Quinoa, that high in protein power grain, is everywhere. When I say everywhere, I mean you can find it at Wendy’s and in my couch cushions. You can’t get away from the stuff. Kellogg’s is trying to do better but only gets part of way. Cut the sugar, increase the almonds, and make sure it doesn’t taste like a crappy cereal. I give this cereal a two thumbs down (which is my lowest rating as of today). Quaker Breakfast Flats: Should You Eat Them? Here are the ingredients from a similar, more natural, box of cereal. Granted, there's no fruit in this one but I thought the other ingredients offered a good comparison. Total sugar 4 grams btw. Still high for me but I have to say it looks far healthier. So, it's kind of you to say that Kellogg's is trying to do better but they have a way to go. KAMUT® khorasan wheat flour*, wheat bran*, whole wheat meal*, cane sugar*, whole oat flour*, spelt flour*, barley flour*, whole millet*, barley malt extract*, quinoa*, sea salt, honey*. *Organic. Have you ever checked out the ingredients in Campbell's tomato soup?? There are 12 grams per serving! 2 1/2 servings per can. So, eating an entire can (and a 10oz can makes that very easy!) you would ingest THIRTY GRAMS!! I'm so sad that as a type 2 diabetic I can no longer enjoy this favorite! Sadly, there just isn't a good cold cereal option. 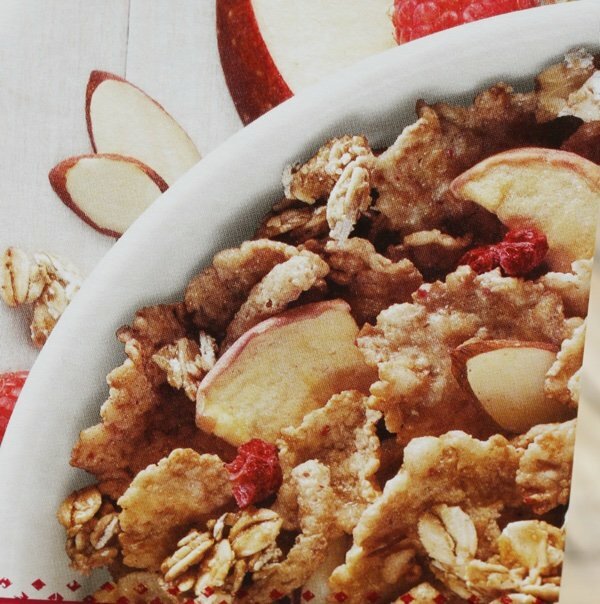 All of Special K stuff is full of ingredients I don't want to eat. I grew up eating cereal for breakfast and I still like it but I can't find one that's acceptable to me. Ezekiel seems ok ingredient wise but it's high in WW points for a 1/2C serving. It took me a long time to realize that cold cereals just don't work for me. Curiously, Special K cereal in Canada doesn't have High Fructose Corn Syrup. When I lived in the US 4 years ago I did an ingredient list comparison with my sister who lived in Canada and found the ingredients different. We were both looking at Original Special K. The ingredients on the box here has: rice, wheat gluten, sugar, wheat germ, salt, modified milk ingredients, corn and barley malt extract. 4g sugar/serving. I wonder what other products have a different ingredient list between the two countries. You are better off making your own granola, so you can control the amount of sugar, or, even easier, doing overnight oats, which I eat pretty much every morning. The only sweetener I add is a drizzle of pure maple syrup and top it off with fresh berries. The rest is just rolled oats, plain yogurt, chia seeds, hemp hearts, unsweetened almond milk, and (maybe) a tbsp of powdered peanut butter. I also top it off with organic cocoa nibs for a bit of crunch and a little kick of dark chocolate flavour. Delicious. My kids like overnight oats, too. I've found NATURES PATH cereal satisfies my cold cereal craving [this time of year]. 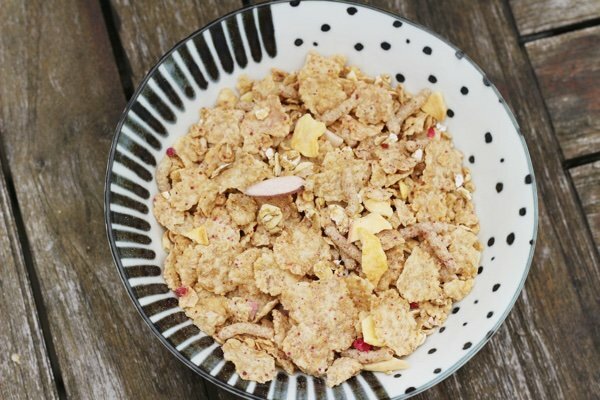 Their ''O''s have 4g sugar/serving, fruit-juice sweetened Corn Flakes 3g sugar/serving, and their Crispy Rice cereal [made with brown rice] has just 2g sugar/serving. All their products are certified organic, non-gmo; many are gluton-free like the Crispy Rice. I just add a banana or berries and feel guilt-free enjoying these cereals or offering them to little ones in the family. If you live in the East, Ocean State Job Lot carries a large assortment at great discounts. Thanks for the heads up!! I don't eat much cereal because of all the sugar. I usually stick to oatmeal or shredded wheat. I love the shredded wheat with the bran and I love that it only has 2 ingredients!! Wheat and bran!! Easy enough!! I've never understood how food companies can get away with a photo on their packaging that looks far removed from the actual product. Isn't this false advertising?!! The absolute biggest scam on the American public is cereal. When I see people in the grocery lines with kids, the basket is almost always full of cereal. Per ounce, it is the biggest waste of money and the biggest increase to waist size. Kids are programmed to think that cereal with make their lives exciting and fun. Parents are programmed to think that cereal is nutritious. Both are advertising scams. Cereal is one food that, if banned, would lead to increased health of children and adults. It is an expensive bowl of empty calories. It would be better to give your child the money that you would spend on that box of cereal and let them buy a toy or a book or whatever. The idea that breakfast should consist of crap like cereal, waffles, pancakes, biscuits, etc. is disgusting. Make enough dinner to have leftovers for breakfast and it would increase health and cash. It only takes a minute to pop leftovers from dinner into the microwave in the morning. Protein and vegetables will fill a person up way longer than any of the usual breakfast choices. Give the money saved to the family members to spend or save toward a special activity. Kids love "Upside Down" stuff. They will brag to their friends, "We have breakfast for dinner and dinner for breakfast". Scrambled eggs for dinner is an inexpensive and filling meal. Meanwhile, think of banning all cold cereal from your house. It takes about twenty-one days to break a habit. A couple weeks of whining might occur, but after about three weeks, it will be a learned behavior that will benefit the budget and health of the family. I stopped eating Special K cereal years ago. I didn't even have to look at the label, it just tasted off to me. I really like the Natures Path Heritage Flakes - they have a satisfying nutty/toasted flavor and help me feel full and happy for a few hours. They have 4 grams of sugar, but a good serving of whole grains, fiber and protein. I grab a box or two every time I see them on a decent discount. I like Mom's Best plain shredded wheat with a little Bear Naked Fruit and Nutty granola mixed in. Add a spoon full of raisins and a sliced banana. My favorite regular oatmeal, honey, raisins, and a sliver of butter; yum! time before adding the butter etc. 10 grams of sugar is more sugar than you would find in a cereal you KNOW is sugary. Life (cinnamon) has 8 grams. Things like fruity pebbles, Reese's puffs, and even Cinnamon Toast Crunch "you can see the sugary swirls" was there slogan for a long time, they all have 9 grams of sugar even. Cheerios just came out with a new "protein" branded cereal I kid you not it said 17 grams of sugar in 14 oz box as well! Hi everyone! I was actually just going to ask for a recommendation. Are there any good cereal choices out there that are dairy free? Its really fun . LOved it. My brother appreciating me for gluten free diet and your post is really inspiring. Keep sharing your wonderful work.